엔토 매니저님! Cheryl 선생님은 어떤 분이신가요? 경력 21년의 베테랑 선생님, Cheryl 선생님은 엄마와 같은 포근한 스타일로 학생들을 가르치고 보살펴주시는 스타일 입니다. 경력은 오래 되셨지만 아직도 젊은 선생님 못지않은 열정을 가지고 에너지 넘치는 수업을 진행해주십니다. 다양한 영어회화 스킬을 배우고 싶으시다면 적극 추천해드립니다. 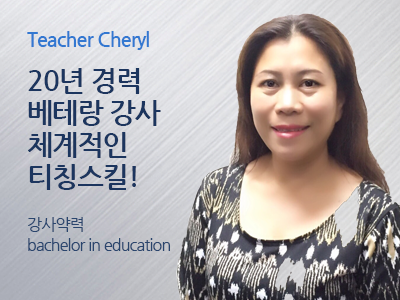 This is Teacher Cheryl,a licensed teacher. 저는 셰릴이며, 교사 자격증을 갖고 있습니다. I have already been working as an English teacher for 21 years and how interesting it is to teach English to Korean students online. 저는 벌써 21년째 영어 강사로 일하고 있고 온라인으로 한국학생들에게 영어를 가르치는 일이 얼마나 재미있는지요. I am very excited to know you. I will do my best to pour down my knowledge to my student through class. 여러분을 알게 되어 매우 흥분됩니다. 수업시간을 통해 나의 지식을 여러분에게 퍼부어드리도록 즐겁고 열심히 하겠습니다. Thanks very much and put more power to all of us!!! 우리 모두 힘 내시기 바라며…. 감사합니다!! !